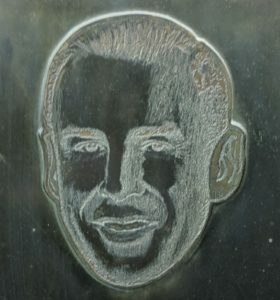 James Lovell’s face on plaque at Gen. Mitchell International Airport in Milwaukee, outside the Concourse D exit. The morning of Saturday, April 7, 2018, I called James Lovell’s Illinois house. I haven’t been nervous for an interview in a long time but Lovell’s stature, his undeniable capable nature had my voice and questions shaky at the start. And midway through the call, my phone breaks up a bit, leading Lovell to ask me again about the background of this anthology and then, correctly, to tell me to take my phone off speaker and to talk more clearly. Freshly 90 years old and Lovell is still the steady astronaut, the reliable best of what America — and Milwaukee, his hometown amid time spent across the Midwest — can be. Lovell, the namesake of downtown streets and played by Tom Hanks in blockbusters, shared in the following Q&A his straightforward and sometimes humorous remembrances of Milwaukee, advice for youth interested in science careers and views on space exploration to come. Today, his birthday, I present a heretofore unpublished Q&A with James Lovell. 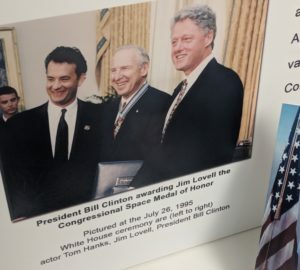 James Lovell: Well, maybe my wife is the most famous person ever from Milwaukee. I did see the story recently where they were able to figure out that name situation, with that crater on the moon you had named for her. Yes, that’s right. There was a little fragment of mountain on the near side of the moon that was used in the Apollo flights, Apollo 8, 10 and 11, and finally the international astronomical union that has the authority to name things on the moon did finally accept the name Mount Marilyn. 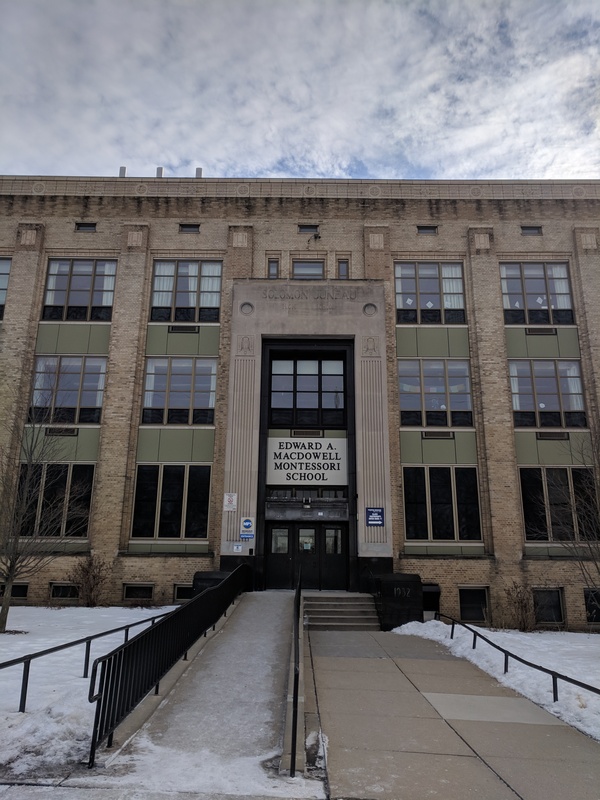 MacDowell Montessori school in Milwaukee, the former Juneau H.S., Lovell’s alma mater. What are some of your memories of youth in Milwaukee. I was in Milwaukee in grade school, went to grade school at Story School on the west side of Milwaukee, then went to Juneau High School in the early ‘40s. It was actually in high school, during World War II, where I did meet Marilyn. And then I went to the University of Wisconsin for two years and finally ended up at the Naval Academy by 1948. How did you and Marilyn meet. You were high school sweethearts, right? I lived on 35th Street, between Wells and Wisconsin, it’s all changed now. Marilyn’s father was the guardian of the Tripoli Temple on Wisconsin Avenue. So she lived there and she went to Juneau High School … and I met here there at Juneau. We used to walk all the way from that part of the city all the way out to the west side where the school was located. How did you catch her eye? I was a junior at the high school and there was a prom. You had to invite a junior girl. The school was kind of small, we only had about 80 students, I think. I invited a girl, a junior girl, but she found out I wasn’t going to prom king, so she dropped me. [Both laugh.] And then I finally saw this freshman come through — served food at the school cafeteria — and she would come through at noon time. I asked her, I didn’t have any other girls to invite. She accepted. She didn’t know how to dance and neither did I, so we worked together on it. Then, after that, I started dating her in my remaining time at the high school and she went to Milwaukee State teacher’s college and I ended up at the Naval Academy. I invited her, eventually, down there, and then she transferred her grades to George Washington University, came down and got a job at a department store and spent the weekend at the Naval Academy. We had dances there. Now, your family moved around when you were young, why did your family move to Milwaukee? We moved there about 1939. My father had died and my mother, she got a job with her uncle, in Milwaukee, he was a manager running an office of the Holland Furnace Company at that time. She was his secretary. We’ve been in Lake Forest for about 30 years. … But my wife is from Milwaukee and my mother was in Milwaukee so we have ties there. Milwaukee has a unique place for me, in my early years. Wisconsin, too, not just Milwaukee. As a junior in high school, during the war, I worked on a farm in the Fond du Lac area. I’ve gone fishing way up north on the Flameau flowage, up there, in the northern part of Wisconsin. There’s an aviation club associated with the airport where I’ve donated quite a few of my artifacts. But the people, in Milwaukee … I made a lot of friends. Inset of Lovell exhibit at Mitchell Gallery of Flight Aviation Museum, tucked away at Gen. Mitchell International Airport. What could you see from space? I know it might sound ridiculous, but could you see Milwaukee or Wisconsin in orbit? No, we were too far south for that. We saw quite a bit, obviously. I could say I saw Milwaukee, Wisconsin but all I did was see the Earth itself. I couldn’t differentiate Milwaukee from Chicago from Dallas. Did you bring anything from home, from Milwaukee into space? I brought a picture of my wife, sure. You were limited to what you could take. Photographs of the wives was fine. Was there anything in your upbringing, in your schooling, even the Midwest, that you could say lead to your interest and understanding in science and space? Of being in the space program? I was very much interested in high school, this was during the war years, we were learning about the B2 rocket that was happening. I was very much interested in rocket technology. Although I didn’t know much about it, I read a pamphlet by a guy named Robert Goddard who was a professor out in Massachusetts, he wrote an article on the development of a liquid fuel rocket engine and methods of reaching extreme altitudes with those rockets. So, when I was looking to graduate in high school, I wanted to become a rocket engineer, but I didn’t have the funds to go to schools that would teach me what I needed to know. But that’s when I finally did get an appointment to the Naval Academy. Was there a teacher or anyone who encouraged you in Milwaukee? I know you’re very big on getting young people involved in sciences and the space program. Oh yes, the chemistry teacher, in our senior year, a couple friends were trying to build a little rocket. The chemistry teacher helped us make the proper fuel ingredients to make it go. I think it went about as far as 80 feet. All the teachers … the physics teacher was also helpful in aiming me in the right direction. I was interested in space flight before I even could spell it probably, back in those days. What was the emotional feeling, at the time, the emotional feeling of going into space? I had made four flights into space – two Geminis before I made two Apollos. I got quite used to being in zero gravity and looking the earth during the Gemini flights. Finally, with Apollo, we went to the moon, just about 50 years ago now. And my final flight was the infamous Apollo 13. How did you keep you head straight [on Apollo 13], as things went wrong so quickly? You had to have a positive attitude. If I got in a fetal position and waited for some miracle to happen, I’d still be up there. 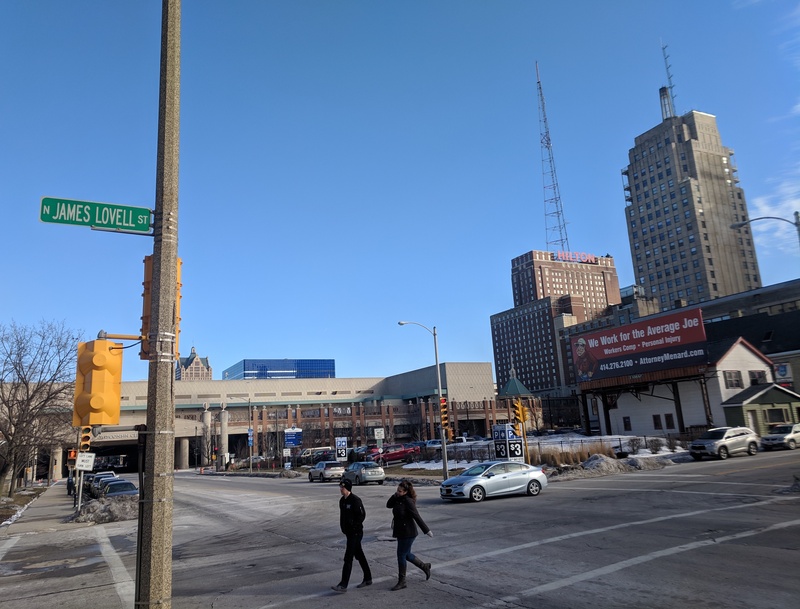 North James Lovell Street in downtown Milwaukee on a winter day in 2019, looking eastward from Wells Street. Looking through some archives, and stories the [Milwaukee] Journal Sentinel had done, they gave you a ticker-tape parade in Milwaukee when you came back. It was a super-busy day, all types of awards. What do you remember about the city on that day? That was quite a day. My family visited in 1966. 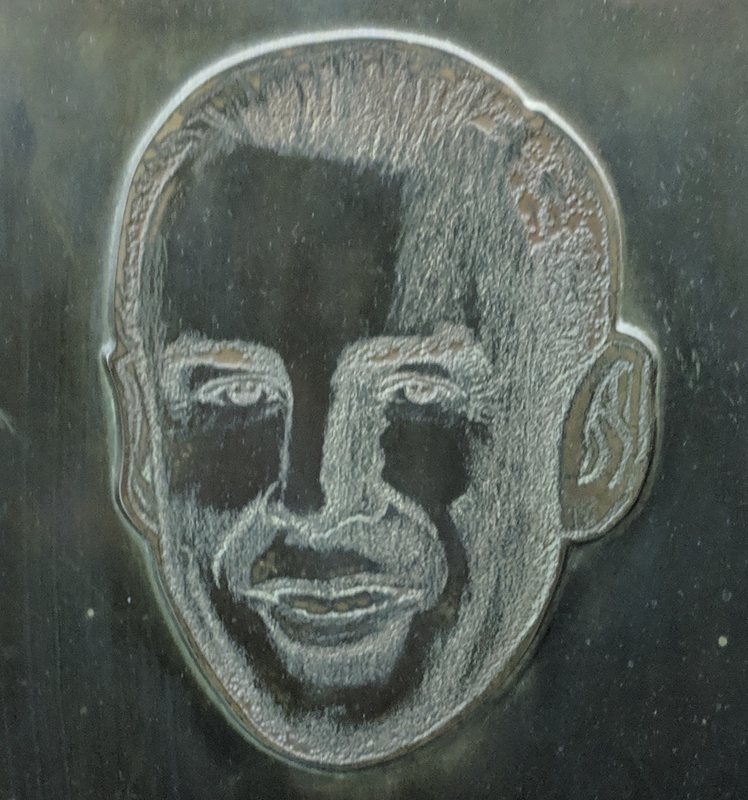 Mayor Meyer was the mayor. We walked down Wisconsin Avenue, there were fond memories of Milwaukee all day. Of course, when I made my orbital flights in 1970, Mayor Meier thought that I was going to run for office. He essentially turned Jim Lovell off of Milwaukee. He didn’t want to see me anymore. Obviously, I wasn’t going to run for politics … The city was really helpful, we had all sorts of people come out for the parade. I went to various schools, to a manufacturing plant involved in the Apollo project, gave a talk that night at a banquet. As a matter of fact, they presented me with a picture that is now hanging in the airport, at Billy Mitchell Field. You spend a lot of time talking about getting young people involved in the space program and the sciences. That’s one of my objectives, in my older age, to encourage people to get a good education. Especially in the technical fields. When I think of Milwaukee, you have a city with a long manufacturing history, a long history connected with industry and the sciences. Why do you feel it’s so important for young people to get involved in those fields? It’s not too early to start looking at what you want to do. By the time you’re in high school, you have a pretty good idea of the kind of career you’d want to follow. Pursue that. There will be some downturns and disappointments. But if you continue and persevere, you’ll eventually succeed. The space program always seemed like the best of America to me. It brought people together toward a common goal. I’m wondering, do you feel that still has a role nowadays, or something that’s missing nowadays, that the space program can still bring people together? Oh yeah. The program still has a lot of positive qualities. It also is a great equalizer with other countries. We’ve been working together with Russia in the space program even though we’re at odds in other ways. What excites you about the space program today, or even some of the private things like Space X? Even the commercial aspects, the government aspects, they’re working together to accomplish things. They’re still trying to figure what the future is going to be. Don’t hold your breath that people are going to Mars tomorrow. There are many positive concepts, but going to Mars in 5 or 10 years … going to the moon after 10 years from when President Kennedy said it was a possibility, sure, but that’s only 240,000 miles away. There are aspects and dangers of going to Mars that were not there in going to the moon. Do you remember the last time you were in Milwaukee, and some of the things that had changed? Last December, I gave a graduation address at the University of Wisconsin, and I was impressed with the advancement of the school itself, the brick and mortar type things, as well as the size. I recall those years quite vividly, but back to Milwaukee … the transportation [and] the road system, compared with the time when I was there, has changed. It’s quite different now and quite advanced. It had to be, because the automobile advanced. You’ve had such an incredible life and career. I’m trying to put myself in the shoes of a kid who’s a junior in high school, in Milwaukee, who maybe has a dream of being involved as a pilot, in the sciences, or going to space. What advice would you tell them? Whatever the teenager wants to do, they should start it as early as possible. Get qualified, if it’s a technical field, find out the kind of technology you need to learn about. If it’s in business, aim that way. Eventually, if it’s in education, look at what you can do to be a professor or a teacher. It comes down to what you want to do. What is your desire? What attracts them? This entry was posted in Kulture Warrior, My Stories, They Don't Call It The Olds and tagged astronaut, Belt Publishing, James Lovell, Milwaukee Anthology, NASA, Tom Hanks. Bookmark the permalink.